Ligue 1’s new ‘big two’ played out a reasonably entertaining 1-1 draw. Laurent Blanc made three changes – Marquinhos made his first league starts in place of Alex, while in the wide positions Hervin Ongenda and Lucas Moura made way for the returning ex-Napoli duo of Ezequiel Lavezzi and Edinson Cavani. Claudio Ranieri named an unchanged side – Jeremy Toulalan was still out injured, while James Rodriguez continued on the bench. 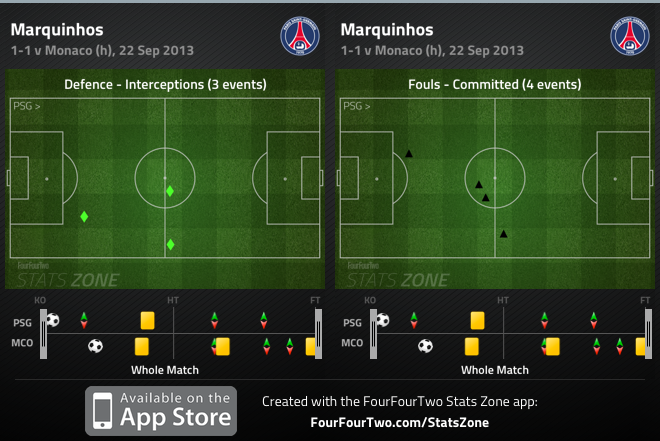 The start of this contest was cautious, but as the tempo dropped PSG’s creative players saw more of the ball. Both teams started with a relatively high defensive line, but rather than this benefiting pacey attackers it seemed to play into the hands of attacking full-backs. With the game squeezed into the middle of the park, the full-backs were able to overlap not merely to support their wingers and allow them inside, but to actually break past the opposition defence at times. Layvin Kurzawa, the Monaco left-back, was the first full-back to scamper forward dangerously, but the first half’s key player turned out to be Maxwell, PSG’s left-back. He constantly motored into the opposition half and worked nicely with Lavezzi, who made intelligent darts inside to drag Fabinho into central positions. Lucas Ocampos didn’t neglect his defensive duties, but nor did he seem particularly comfortable tracking Maxwell, and the second time the Brazilian got forward, his cross set up his good friend Zlatan Ibrahimovic for the opening goal. Both sides looked to their full-backs because the early midfield battle prevented either from putting together good passing moves. Broadly speaking, both sides had one player looking to create, and two looking to destroy – and this emphasis meant the first half saw little invention from central positions. The two players looking to create were both shut out in the opening stages. 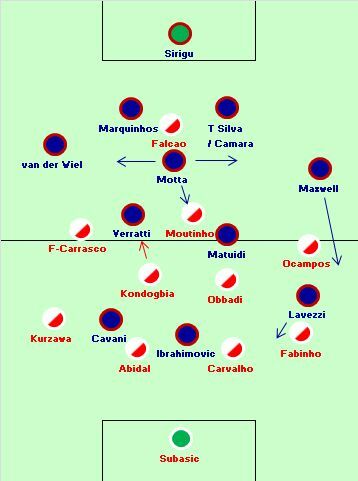 Geoffrey Kondogbia was fielded to the left with specific instructions to close down Marco Verratti quickly (although the Italian did the reverse effectively too) while Joao Moutinho – still adjusting to this position at the top of a midfield trio – was closed down well by Thiago Motta, who is capable of being more creative but played a physical, destructive role here. Along with Maxwell, Motta was the first half’s other key player. He was happy to close down Moutinho even when the Portuguese midfielder moved deeper than the other two PSG midfielders, but he also spent a great deal of time covering for the full-backs in wide positions. Many of his challenges occurred away from the central zones. Monaco’s attacking lacked clarity – on the break they focused play down the flanks, through their two wingers, but when PSG got men behind the ball they were unable to compensate for Moutinho’s lack of impact. One potential source of excitement was when Monaco managed to drag Marquinhos out from the defence – he stuck too tight to Falcao and committed a succession of fouls. However, Moutinho is hardly a natural midfield runner and the wide players weren’t in a position to exploit that space either. In the end, Monaco’s equaliser came from a set-piece situation, through Falcao. After conceding the equaliser PSG improved. The tempo of the midfield battle dropped, with Monaco closing down less quickly. The main beneficiary was Verratti, who was able to thread forward passes carefully between opponents and prompt good attacking moves – he played one excellent pass to Ibrahimovic on the break, but he wasted the opportunity with a cross-shot that missed both Lavezzi and the far post. At the start of the second half PSG were much sharper with their closing down, and Monaco failed to match that tempo. PSG seemed to have more of an all-round threat: the full-backs were causing problems, Verratti was more of an influence, and long balls to Ibrahimovic looked promising too. Lavezzi was lively on the left, although Fabinho had a couple of opportunities to break past him in response. Both sides could have settled for a 1-1 here – but pleasingly, they didn’t. Ranieri replaced Kondogbia with James Rodriguez, pulling Moutinho back into a deeper position. Blanc first replaced Lavezzi with Lucas Moura – who played on the right – before Jeremy Menez replaced Verratti and PSG went to something more like a 4-2-4, with Menez either side of Ibrahimovic and Cavani. The more open the game, the more PSG threatened to score a second – and they really should have triumphed. The wastefulness of Ibraimovic and Cavani was a major reason for the score remaining 1-1. Two of the star strikers (Ibrahimovic and Falcao) scored, and another (Cavani) had plenty of chances. But the key players in PSG’s first-half dominance were Motta and Maxwell – the former nullified Moutinho and covered in the full-back positions, while the latter was free to bomb on past Lavezzi and cross dangerously. Monaco’s pressing dropped to allow PSG forward in the second half, and in combination with the home side’s increased tempo, the champions really should have won this game. A point suits Monaco.